Тема в разделе "Новости Guildwars2.com", создана пользователем iRedisko, 12 сен 2018. Shacknews: Congratulations on celebrting the sixth anniversary of Guild Wars 2! How has the team celebrated both in and out of the game? Mike Zadorojny, Game Director: Within the game, we actually did a number of things. We released a feature that players didn't see coming, which was the new novelty wardrobe. Basically, items that were created in the game for fun, but didn't really have a purpose other than just showing off for the player now goes into the wardrobe system. So it's been taken out of all your character slots, your inventory slots, your bank slots, and is now shared across all of your characters. 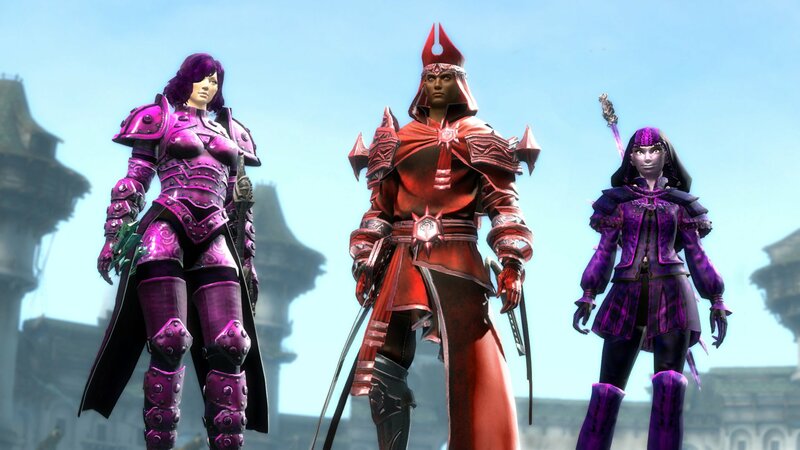 We added a full armor set for the sixth birthday of characters for their accounts. This was our way of saying thank you to all the dedicated fans that have been here a long time. Then obviously, there were other things, like experience rolls, karma items, weapons, and additional items added on from previous years. In the game, it was a lot of fun. Internally, at the studio, we actually celebrated with a bunch of cakes. [ArenaNet President] Mike O'Brien was out of the office, so I was forced to give a speech to the entire studio. (laughs) And I talked about the lineage of where we come from, because this is not only six years of Guild Wars 2, but this is building on the legacy of Guild Wars before it. That's been almost 13 years at this point, in terms of how long Guild Wars has been there. It was a nice way to celebrate how far Guild Wars 2 has come, how far the franchise has come, but it's also a grounding point for us leaning towards the future, in terms of where we want to take Guild Wars 2 for us and what the studio is going to be looking forward to in the future, as well. Shacknews: You made sure to emphasize the Living World in your anniversary video. How has the story evolved over the past six years? And in particular, how has the idea of the player's personal story evolved over the last six years? Mike Z: When we originally launched the idea of personal story in Guild Wars, we wanted to start with a known quantity for the players. We had a 'Mad Lib' that let them choose their own personality and own who their character was in the game before they even started. That way, at least the game would recognize some of the decisions that they've made before they even set foot in the game. On top of that, as we started going through the personal story, we started building branching quests and giving players a chance to choose the direction of what the style of hero was that they wanted to build. That was the first 80 levels of gameplay. Then we started looking at what was coming next. With Season 1, we wanted it to be big, monumental shifts, changes, encounters, things that players would remember. But we wanted to highlight the fact that you were there during that time. Season 1 was built where we'd build a month-long celebration of whatever the content piece was and then we'd retire it and move on to the next one. While that sounds really good, because you could say, "Hey, I was there when it all happened," it meant that any player that came in a little bit later didn't get a chance to participate in that. They only got to hear stories of it. So moving forward and moving into Season 2, we felt the better approach was to build something that lasted a little longer. Yeah, it was cool for the people that were there, but we wanted to make sure that anyone who came in a little later didn't miss out on that and that they had a chance to experience what the story was. The story is so important for Guild Wars 2, getting to know all of those characters and allies. By missing Season 1, you missed out on the introductions of Braham, Taimi, Rox, and all those guys. So it's just one of those things where you didn't get a chance to be as familiar with that crew. And even when we went back later and added recap cinematics, it recaps the high-level beats of what Season 1 was about, but doesn't give you those intimate moments, like Taimi first sneaking into Lion's Arch and pretending Braham was her guardian and getting Braham in trouble with the Lion's guard. These were character moments that you just didn't see, because you weren't there when it happened. And towards the end of Season 1, the last four episodes, we on-the-fly changed direction of where the story was going, because Scarlet [Briar, main Season 1 villain] up to that point had been an unmemorable character. It was kind of a "monster of the week" kind of, "Oh, she has this new ally that she's throwing at you!" So we re-jiggered the last four episodes that led to the destruction of Lion's Arch. And we really built on fleshing out her character and making her more personal to the players. Then when you had the chance to stop her towards the end of Season 1, it was a climactic moment that felt worthwhile. It felt like the culmination of everything we'd gone through in the last year. Shacknews: I'm glad you mention those changes towards the end of Season 1, because I want to go into the process of how you plan out these seasons narratively. Do you have a plan going in of where the story going, or do you take it episode-by-episode and go from there? Mike Z: The best way to describe it is that the further away we are, the more in flux things are. The closer you get to dealing with that individual episode, the more things get solidified. When we launched Guild Wars 2, we actually had years worth of planning from a story standpoint -- where we saw things going, the rise of certain dragons, like we knew when Guild Wars 2 launched that the Sylvari were minions of [Elder Dragon of Plant and Mind] Mordremoth. A lot of Season 1 was building up and Season 2 was building up that discovery and what it actually meant. So we usually have a high-level plan for the season, in addition to, long-term, where we want to go. But some of the details of that season get built in as we go. We can discover we really dropped the ball on something. Like, we were too subtle in Episode 1 and players didn't catch on or we were too overt. It's a little bit more flexible further out. We usually come up with a season arc before the season starts, knowing who the villain is and how we're going to be building them over time, what the key encounters are going to be throughout the season, what the twists are, and once we start development, we start fleshing out the story of that map and how it relates to other storylines and those types of things. Mike Z: The thing that we've actually been doing is what we've discovered is that [second expansion] Path of Fire has been a really good starting point for new players. If you're ready to jump into the game and get into the story, there's a good enough lead-in in terms of Kasmeer and Rytlock opening the story and introducing the characters, that you don't necessarily have to play the original legacy content to know where the story is going or what you need to do. We've done that a couple of times now, like when [first expansion] Heart of Thorns started, we did the same kind of thing. You don't get the history of where the characters meet, but you don't have to, in order to appreciate or understand what's happening in the present day. Everything that happens in the Living World that comes after an expansion builds on the story of that expansion. So everything that we've been doing up until now has been about Path of Fire and Balthezar and his desire to kill Kralkatorrik. And everything that we've seen this season afterwards has been about the aftermath of that encounter and what it means for the world now that Kralkatorrik is still out there and has even more power. There's that legacy story that helps understand how the world got to where we are today, but then there's those bridging points that where you come in today and there's a good starting point that allows you to continue to move forward. That legacy content helps flesh out the world and give you additional lore. Shacknews: What can players expect from the Living World in the near future? Mike Z: We are starting to ratchet things up, bigger threats, bigger villains, if you can imagine that on top of what we've done just recently. The promise that we're making players right now is that this season, we are planning to release a new mount that players weren't expecting. And the thing we're saying right now is, Living World is working. It's an amazing strategy that allows players to come in every two to three months, get a really cool piece of content, get a new map, play the expansion with their friends. But now we're raising the stakes and we're actually starting to release what we'd consider expansion-level features, alongside these things, when they come online, when they're ready. We're not saving things for big expansions anymore. These things come online when they're ready and we're going to keep releasing them. Closely to this, we're obviously continuing our storyline, continuing to build our characters, releasing legendary weapons, we're still working on Fractals, and that's in addition to our content that we're working on for World vs. World. And one other major thing that's coming up is coming with the next episode and it's called Sun's Refuge. This is a personal story instance that will upgrade over time, as the players are playing through Episode 4. The idea is that we're going back to an iconic Guild Wars location and players, through playing the storyline and playing through the open world, will find additional allies that they'll bring back to Sun's Refuge, they're gonna unlock additional horns, upgrade an additional armor set, and there's a ton of collection that will help build up the lore and overall help players understand where we're going moving forward. Shacknews: I want to go off on a bit of a tangent, as long as we're celebrating six years of Guild Wars 2. I want to go all the way back to when I first looked at this game, pre-release. I remember at the end of this meeting, I was told to relay a message to [former Shacknews Editorial Director] Garnett Lee saying "The dragons get much bigger." You've unveiled some huge dragons over the course of the Living World, so I wanted to ask... do they still get bigger? Let's just put it this way. We're not done with the dragons yet. So there's still things that we'll be doing that will be surprising to players. When you talk about Elder Dragons, these are cataclysmic, massive forces of nature, so obviously they're about to take on new personas, different sizes, different styles of threat. There's not just one formula that says we have to make bigger and badder, but we definitely are trying to whenever we're creating an encouter, we're trying to look at what we've already done and where we've come from and we want to make sure we're always providing something new. Shacknews: Lastly, Halloween's coming! We know what happens every year at this time of year. So what can players expect from the Mad King Thorn this year? Mike Z: We do have a couple of surprises that are coming for Halloween this year, because fans of the franchise and the lore know that Mad King Thorn does have some history now with the player and other iconic characters from the game. So we're going to build upon that and go from there. Obviously, we saw that with the release of the Roller Beetle in Episode 3, players just really enjoy creating their own beetle races and those types of things, so we've been paying attention to that.